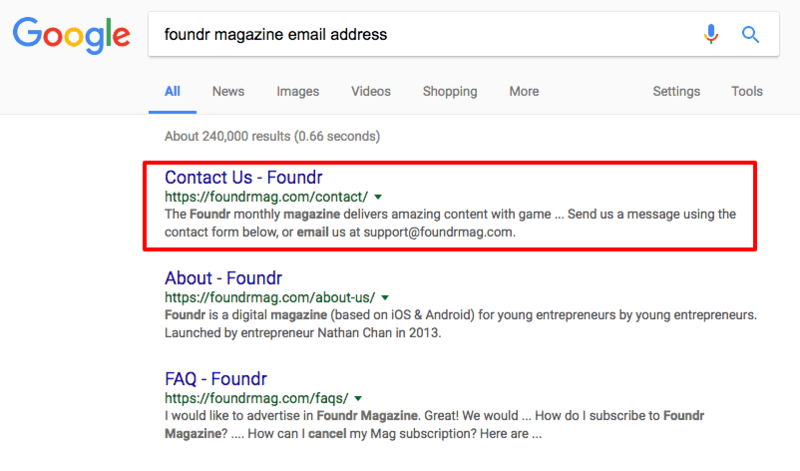 Whether for partnership opportunities, influencer marketing outreach, or media pitches, at some point, every business owner has to hunt down and find someone’s email address. As a marketing consultant, I’ve had to do this many times over the past four years, particularly to contact influencers for marketing campaigns or pitch journalists about my client’s upcoming launch. So you could say I’ve honed email address hunting down to a science. Below I’ll give you step-by-step instructions on how to find anyone’s email address (particularly an influencer or journalist) and what to do if all else fails. When we start talking about how to find someone’s email address, things can get spammy fast—and we don’t want it to go there. If you’re trying to track down an email address, this means you likely have no connection to this person, so tread carefully. With this tutorial on how to find anyone’s email address comes great power, and with great power, comes great responsibility. If you’re wondering exactly how to make sure you’re not crossing over the invisible line between respect and intrusiveness, here are three key principles to help you not be that person. 1. Make sure there isn’t some other preferred way to contact this person. Many major bloggers will say on their website that they do not accept certain emails, or they request that you don’t email them at all. Respect their wishes and reach out to them in the way they ask. For example, on Tim Ferriss’ contact page, he clearly outlines what you can and cannot contact him about. He also asks readers not to email him. Instead, he prefers that they comment on his blog posts if they have any questions. Consultant Brennan Dunn lists the different ways you may contact him, depending on your goal. If you want to discuss a partnership, he asks you to email him. But if you want his advice, he recommends reaching out on Twitter. So before reaching out to an influencer, check their contact page for any instructions. You don’t want to blow your first impression by not doing your research. Also, if you’re trying to land an interview with a big-name influencer, keep in mind they likely have gatekeepers, so trying to find the influencer’s personal email address may be pointless. Before you start saying, “No, no, those requests are intended for other people, not me,” or “But I’m showing initiative,” imagine what it’s like to explicitly ask people not to email you, but still get hundreds of cold emails anyway, as these people surely do. Now imagine the irritation that recipient must feel toward all the people sending those emails. Do you want to be on the other end of that irritation? Exactly. So be cool. 2. Make sure not to break the law. This law slams spammers with hefty fines if they don’t meet certain criteria for commercial messages. You can also read more about the anti-spam laws of Australia, Canada, and the European Union. Please note I am not a lawyer, so this blog post should not be used in place of legal advice. The assumption in this post is that you’re looking for someone’s email address to reach out about a potential interview or ways you can work together—not to promote your product or business with shady tactics. You should not use these newfound email addresses to illegally grow your email marketing list. The recipient must opt in to your list for that. 3. Make sure to provide value. Do your research beforehand and make sure what you’re pitching is relevant to that person, so you don’t end up annoying them. For example, don’t request a sponsored post about your paleo beef jerky from a food blogger who writes about vegan recipes. Don’t ask a consultant who specializes in luxury fashion brands to do an interview about how to scale a web design business. Not only do irrelevant requests make it clear that you didn’t do your research, but they also increase your chances that the recipient will mark your message as spam. Alright, so you’ve determined that what you’re about to send is not spam? Great! Let’s move forward with how to find someone’s email address, using seven different methods. This one is obvious, but always start with it, and you may avoid having to use steps two through seven. You might have to click through a few results, but don’t waste too much time here. If you don’t find the email address on the first page of Google’s search results, move on to step two. Hunter is an email-finding tool that’s free for up to 100 requests per month, which I’ve found is more than enough. For easy access, install the Chrome extension. Once installed, it can easily be used to scan any website for associated email addresses. Sometimes the Hunter extension won’t be able to find an email address. If that happens, here’s a helpful hack: Guess an email address without actually sending an email by using the Email Verifier tool on Hunter. If it’s a working email address, it will show up in green. If it’s not a valid address, it’ll show up in red. This prevents you from wasting your time with non-functioning email addresses you guessed on. Many influencers and reporters will openly list their email addresses in their social media bios. On Twitter, reporters commonly include their email addresses in their bios, so you know where to send story pitches. Instagram and YouTube influencers typically list a way for you to contact them for collaborations. On YouTube, email addresses often don’t show up until you click a button and complete a reCAPTCHA test. Finding an email listed in someone’s social media profile is also a good indicator that they’re open to collaborations or at least being contacted by someone they don’t know. Most influencers have blogs, and most blogs have a newsletter or some sort of opt-in offer. Find the person’s blog and sign up for their email list. You’ll likely get a confirmation email immediately. Check your inbox. Look at the “From” field of that confirmation email to find their email address. Sometimes this is a dummy email address set up just for the mailing list, but other times people send from a real address to encourage engagement. Anytime someone registers a domain name, they must provide contact information that will be added to the WHOIS database. This information includes their name, address, and email address. So if you know someone’s website, you can search the WHOIS database to find their contact information—that is, unless they purchased domain privacy to hide their personal information (which most big names probably did). Sift through those tweets, and you’ll likely find an interaction where the influencer tweeted out their email address. Many publications either include the reporter’s email address next to the byline of each article, or they include a way to contact them in the bio after you click the reporter’s name. If you can’t find an email address, don’t fret! There are plenty of other ways to get in touch via social media. To contact someone via LinkedIn messages, you must have them as a first-degree connection. If you’re trying to find someone’s email address, it’s highly unlikely you’re connected on LinkedIn. In that case, you can ask a mutual connection to make an introduction. No mutual connections? Then try adding the influencer directly, or adding someone connected to them. The goal here is to achieve at least a second-degree connection to this influencer, so you can (hopefully) get an introduction. It’s common practice to mention someone on Twitter if you’re interested in a collaboration or interview. You can also check to see if they have open direct messages, and you can send them a DM there. Notice how Kristian mentions that he’s connected with Nathan before—this is excellent! Connecting with someone in other ways before reaching out with a request is a great way to build a better relationship and increase the chances of response. Instagram is tricky because when you leave a comment, it can easily get buried in the influencer’s many notifications. It’s best to send them a message, but note that if they’re not following you, your message will get filed away in a separate tab until they click “Allow” on it. If they have a business page, try messaging them there. To do this, go to their Facebook page and look for a “Message” button in the upper right corner. Sometimes influencers disable messages on their page. In that case, you can try posting directly to their timeline. To do this, go to their Facebook page and select “Posts” from the menu on the left. Keep in mind that what you write here is public and will show up under the “Visitor Posts” section of the page. Facebook page owners have the option, just as with messages, to disable visitor posts. If you aren’t able to contact them via their social media accounts, you can try leaving a comment on one of their blog posts or on their “About” page. Be sure to leave your contact info in the comment, and remember that this is public, so anyone who visits that page will see your contact info too. Personalizing an email takes time, but it’s well worth it. When you’re a busy entrepreneur, it can be tempting to copy and paste the same template over and over. Instead, take the time to find out the person’s name, get familiar with their work, and see if you have anything in common. “What’s in it for me?” is what every person thinks when they see a request. While you may think your product is the best thing since sliced bread (and let’s face it, a founder should be proud of their product! ), the influencer or journalist you’re reaching out to doesn’t have a vested interest like you do. Instead of doting on your product, highlight the ways it can help them or their readers. If you’re reaching out to an influencer for a collaboration, make sure you outline the ways you can compensate them, whether it’s with money, product samples, or both. If you don’t hear back, follow up. Always. I do this only once or twice. Beyond that, and you’re getting annoying. I loved your post about , and because you write about , I thought this opportunity might interest you. I work with , and we . We’d like to offer you to write a sponsored post about our product. We can mail you some samples next week. Would you be interested in more details? In your email, show that you’ve done your research on their work, and you’re willing to provide them with something in return. Simple and short does the trick. Now you’re armed with solid ways to find someone’s email address, rules to avoid being a spammer, and tips for getting a response. But keep in mind, email isn’t always the best way to get in touch with someone. You can try reaching out via social media, or if they’re a really big name, you can identify and contact their gatekeepers. The most important thing to make sure here is that your intentions are good and your message is relevant. Don’t be spammy and add them to your email list without their consent, and don’t send them an email that doesn’t provide value. When you’re reaching out to someone with whom you have no previous connection, it’s crucial to know how to write a cold email that gets a desired response. Otherwise, you’re just wasting time. What are some creative ways you’ve used to find someone’s email address? Do you have examples of successful cold emails you’ve sent for your business? Share them with us in the comments!